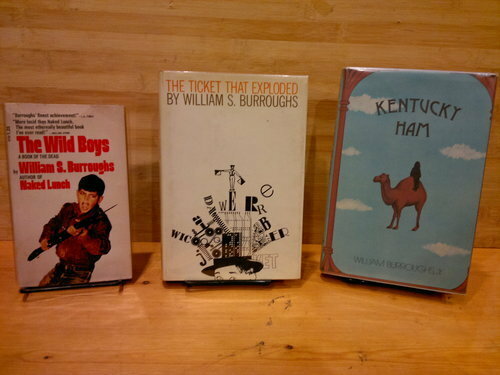 Before I get to the first editions I teased you with in the last post (Soon, very soon! Honest! 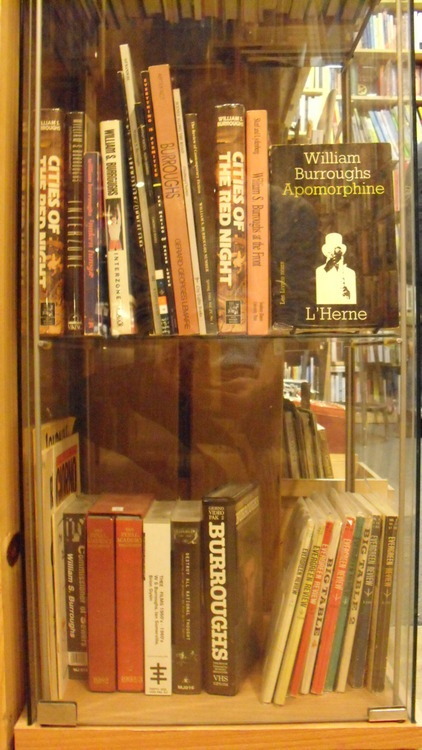 ), I wanted to write a post about our selection of Burroughs books in languages other than English. It’s a small but interesting collection. 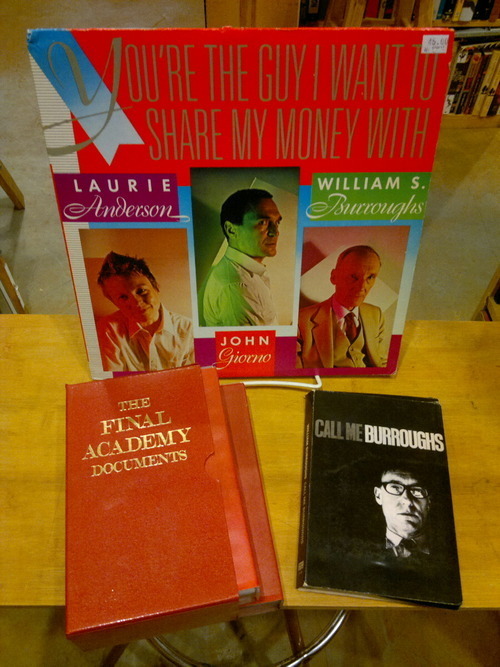 At left, you’ll find several of Burroughs original writings in translation. 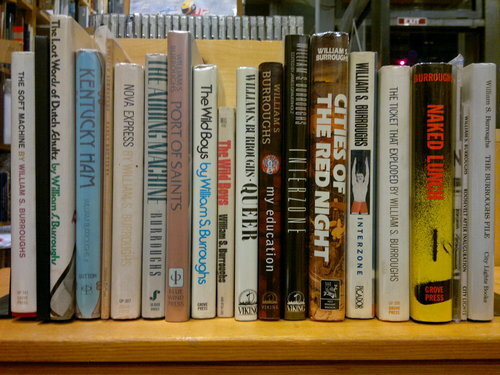 The first two, at top, are the Swedish and and the Norwegian translations of Naked Lunch, Den Nakna Lunchen and Naken Lunsj, respectively. In the middle are two German translations, Die Vier Apokalyptischen Reiter (The Four Horsemen of the Apocalypse) and Die Elektronische Revolution (The Electronic Revolution). Interestingly, these two are actually “backed with” the English version. If you flipped them over vertically you would find the original English texts printed on the other side, like records or old pulp twofer books. At bottom is L’ombre d’une chance, a French translation of Ghost of Chance. Interestingly, the text of this book is printed in three, newspaper-style columns on each page, as you can see from the image on the right. 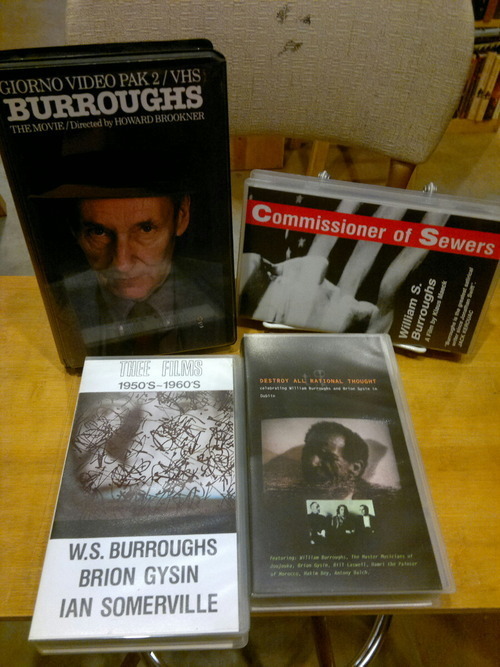 Our last two books are critical evaluations of Burroughs, both in French. 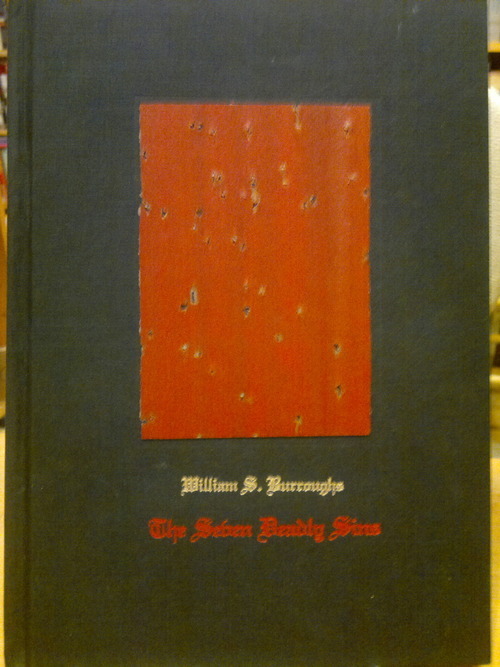 The first, simply titled Burroughs, is by Gerard-Georges Lemaire. 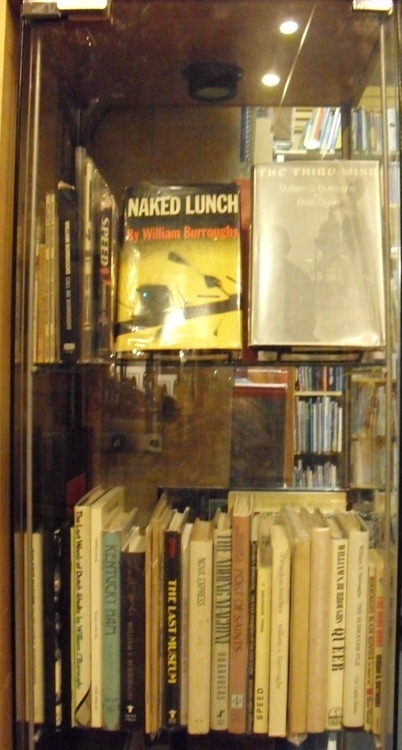 The second is William S. Burroughs: La vie et l’oeuvre, by Phillipe Mikriamos. 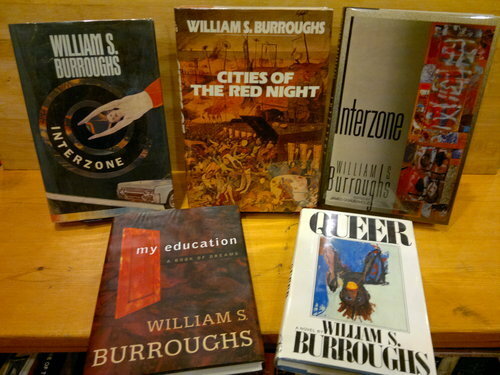 *Incidentally, searching around for information on Apomorphine led me to a fascinating post by Jed Birmingham at RealityStudio.org, a site for Burroughs collectors. 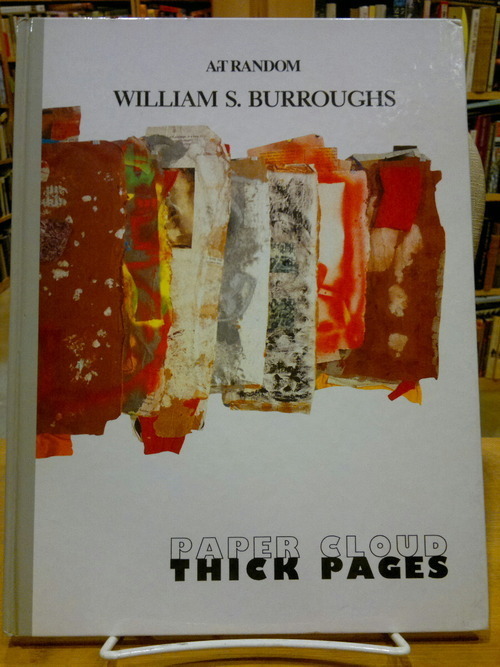 Found here, it discusses (with impressive thoroughness and dedication) the interrelations between Burroughs’s drug use, writing activity, and desire to get clean and respectably published. And I don’t mean he digs holes. I mean we have lots of him. 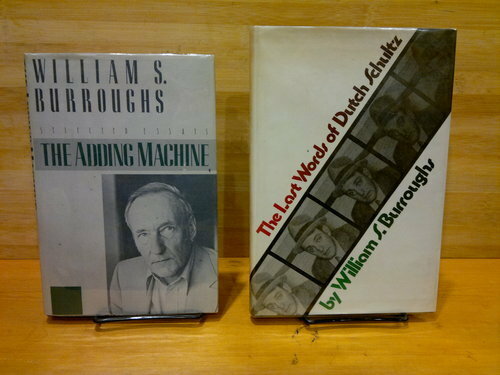 Bibliohead recently acquired a large collection of William S. Burroughs material (Burroughsiana?) 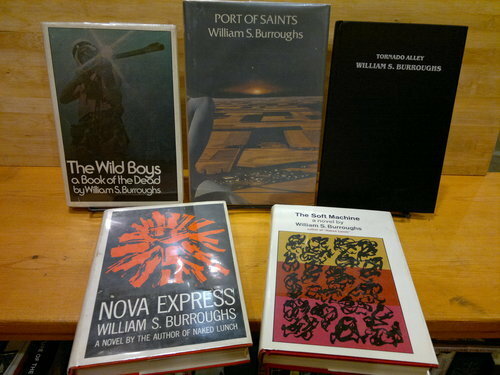 from someone who was, to put it mildly, obsessed (a Bourroughphile?). Over the next few weeks, we’ll be cataloging that collection and posting occasional blurbs about obscure, rare, or just plain neat items from it. This collection has everything from first editions to critical surveys to video tapes to early magazine appearances to translations, from a collected letters to Allen Ginsberg to video from the archives of Genesis P-Orridge’s Psychic Television. 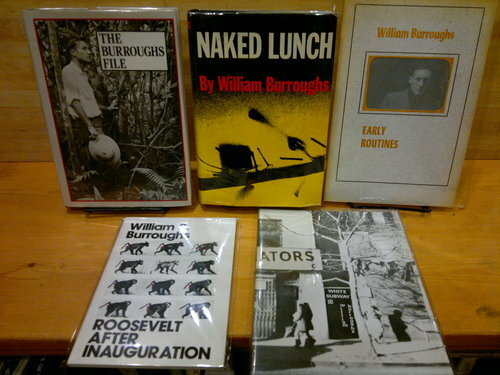 If you’re looking for something Burroughs-related, we’re a great place to start your search. And don’t be scared off by scarcity. There are things in this case for every price range, from first-timers to true junkies. Have questions about something you see? Looking for something you don’t? Feel free to contact us for more info (all of our contact info can be found at the bottom of this page), or just click the “Ask Me!” link at the top of this page!